What is a hot water storage tank? A hot water storage tank is a well insulated tank (or boiler) designed to store hot water. Most domestic hot water storage tanks also do the job of heating the water they contain, although in some systems (such as dedicated solar setups) the tanks are used only to store hot water. How do storage tank hot water systems work? In most tank-based hot water systems, cold water is pumped into the tank by mains pressure, where it is then heated by a gas burner and flue in the case of natural gas systems, or heating elements in the case of electric models. As the water temperature increases, water rises to the top of the tank where it is siphoned off for use around the home. 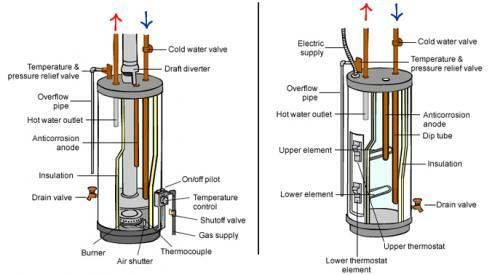 While basically similar, gas hot water tanks (left) use a burner and a flue, while electric hot water tanks (right) rely on heating elements. Tanks used for solar hot water systems work slightly differently, because the water is heated by the sun before it reaches the storage tank. Solar hybrid systems also use a gas or electric booster to maintain a steady temperature. The larger the tank, the more hot water it can contain, but the more energy it will need to keep it at a steady temperature. Tanks are usually very well insulated to prevent excessive heat loss. Most systems rely on mains pressure to feed water around the house, however tanks for solar hot water heaters (and some electric systems) are often mounted on the roof or in the ceiling, and use gravity to distribute water around the house. These are called ‘gravity fed’ systems. Where mains pressure is low or tank or bore water is used, a pump may be necessary to provide enough pressure. There are some basic regulations that govern the positioning of hot water tanks. Mild steel – These are the most common tanks and are found in most standard storage tank systems. They are typically lined with a spun glass polymer (often called vitreous enamel) which protects the inside of the tank from direct exposure to water. Unfortunately, this does not waterproof the whole interior of the tank. Because any exposed steel is in danger of corrosion, mild steel tanks incorporate a sacrificial anode. This rod, usually made of magnesium or aluminium wrapped around a steel core wire, will corrode instead of the steel. Your tank is protected while there is still metal on the rod, but as soon as the rod has disintegrated, any steel touching water will begin to rust, and replacing the anode may not save it. Replacing the sacrificial anode every 5 years ensures the health of mild steel tanks, but forgetting to do so is still the number one cause of tank failure! Stainless steel – These tanks are designed to allow direct water exposure with no risk of corrosion, so a sacrificial anode is unnecessary. Stainless steel tanks are much more expensive than mild steel ones though, which is why they aren’t as common. This trade-off has to be considered – the warranty for stainless steel tanks is usually twice as long as there is a much smaller risk of tank failure. Storage tanks systems are the more prevalent type and are available for all fuel types. Well, I guess I would just opt for the stainless steel storage tank then since it requires little maintenance with its feature that promotes no risk of corrosion. As for the disadvantage of using this system which is to take a certain amount of time to reheat once it is out of hot water, I guess we have to manually gauge when will we run out of hot water, so that we can refill before it actually does. That can prevent unwanted scares of sudden cold water amidst a shower. It's amazing how much technology goes into the humble water storage unit in your home isn't it? Just when you think all you need to do is hook it up to your water supply you realise that there's so much more to it!